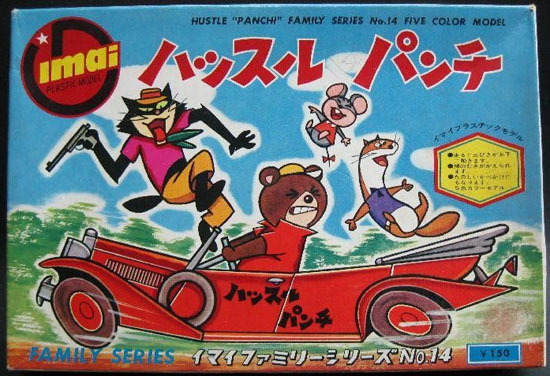 “Funny animals” are a staple in American animation, ranging from Bugs Bunny to Ren & Stimpy, but it is incredibly rare to see one in Japanese cartooons. Generally if an anime stars a talking animal, it means that it’s meant for pre-schoolers, something anime fans don’t take seriously. 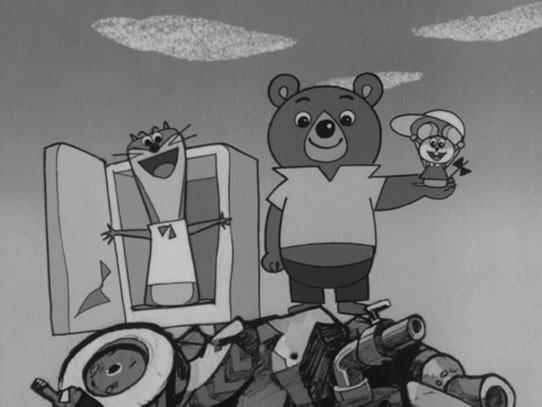 Still, back in the 1960s Toei Animation attempted to produce a talking animal show aimed at general audience. That show was Hustle Punch. The show centers around three hobos that live in a broken car on top of a junkyard: Punch, Touch, and Boom. Punch is a bear who is literally strong-headed: his head is as hard as a rock, and nothing can knock him down. Anyone who tries to smash his head in always find themselves out of luck, as the blunt instrument constantly breaks upon contact. Punch also uses this to literally break a hole in the wall: he just runs to the wall with his head in front and just smashes through. Boom the weasel is an expert shot, using not a gun, but a slingshot. Even when Black the cat shoots his gun at them, Boom can always knock it out by aiming his slingshot at it. Touch the mouse takes advantage of her smallness in order to get into small holes and sneaking into things without the villains knowing. She tends to be naïve, often not understanding the seriousness of a situation that they frequently get into. Professor Gari-Gari is a mad scientist wolf who wants to build a mansion over the junkyard, constantly thinking up evil plans to get the money needed to buy the property, whether it’s creating a machine that creates counterfeit 10 yen (about 10 cents in US money) or stealing priceless paintings and selling it to a high bidder. He is an inventor, creating things that can aid him into doing his deed. If Gari-Gari buys the junkyard, this of course means that the three heroes will have no place to stay, so they constantly thwart his schemes. Gari-Gari has two henchmen working for him: Black and Nyu. Black is a gangster cat who welds a gun, often shooting at Punch and the gang with it. In a cartoon fashion, he doesn’t get seriously injured whenever the gun backfires at him; it just covers his face in black soot and nothing more. Nyu is a simple-minded pig who has big strength. He’s the reluctant one in the group, not wanting to really hurt the main characters. In some episodes he helps them instead, whether he’s tricked into doing it or not. He’s prone into being flattered by Touch the mouse, using her charms on him. The cartoon is fun to watch. The characters have simple but appealing designs, which is perfect for the TV animation process. 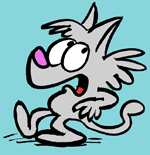 The stories and gags are akin to talking animal theatrical cartoons put out by American studios, although they are stretched to a half-hour running time. If this show was dubbed to English, one could be fooled into thinking that this is an American cartoon; it’s probably one of the most un-Japanese looking anime ever put out at the time. The show was clearly influenced by American cartoons, but it still has its own unique charm to it that doesn’t make it a total copy-cat. Dare I say, Hustle Punch is one of my favorite anime. It’s really fun to watch these characters play off each-other. Reading the credits in Hustle Punch is like looking at “who’s who” in anime. The series was created by Yasuji Mori (1925-1992), a long-time animator, director, and (more famously) character designer at Toei Animation and later Nippon Animation. 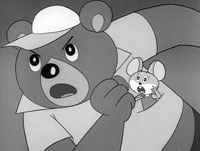 It was Mori who set the standards for the Japanese animation style, many of which are still held today. Among the people that Mori mentored includes Isao Takahata and Hayao Miyazaki, both of whom are now big names in anime. Miyazaki, in fact, worked on Hustle Punch as an animator, one of his first jobs in the field. Isao Takahata, meanwhile, directed the opening title sequence. Another notable name is Nobuyo Ohyama (b. 1936), who made her professional debut as a voice actress on this show, voicing Punch. Ohyama is best known for voicing Doraemon, a role she held for over 25 years. Hustle Punch ran for 26 episodes, all filmed in black and white, on Nihon Educational Television (NET) from November 1, 1965 to April 25, 1966. It originally aired on Mondays at 7:30 pm, but in the following January the schedule was moved half-hour early to 7:00 pm. After that, NET reran the show into 1967, only to languish in obscurity since then. The fact that it’s not in color hampered future repeats. Toei eventually released four episodes on DVD, as part of the “Toei Monochrome Animation” series, which featured other shows from the era. Not that a complete box-set is an impossible pipe-dream. Unusual for other studios, Toei is seemingly gung-ho on releasing every single piece of animation they have done for television, even the black and white ones. It’s only a matter of time until Hustle Punch get their turn. Funny animals did seem more common back in the day in Japan. Not just from Yasuji Mori at Toei, but also from Osamu Tezuka (i.e. Kimba / Jungle Emperor Leo, the rabbit and duck from Wonder 3). Meowth from Pokemon could qualify as a more modern example. This reminds me that I really want to watch Animal Treasure Island. The English dub isn’t bad either, everyone sounds perfect to me, but then again I’m use to those guys anyway. Films like Animal Treasure Island, Puss ‘n Boots and Jack and the Witch were once a staple of the 70’s TV landscape when American-International Pictures offered them through syndication to local stations to air. I noticed this film aired locally sponsored by Burger King for instance! Animal Treasure Island is one of my favorite Toei features. Having finally watched Episode 1 last week, this has got to be one of my favorite anime shows ever! I’ve been promoting Yasuji Mori, who was the first animation director at Toei (when they opened their animation division in 1957), first directing wonderful animated shorts (featuring Koneko/Kitten, who would basically evolve into Toei’s mascot Pero/Puss ‘n Boots) and then becoming animation supervisor/character designer on many anime features (including PANDA AND THE MAGIC SERPENT, MAGIC BOY, and THE LITTLE PRINCE AND THE EIGHT-HEADED DRAGON). It’s sad when he becomes unknown in the US, whereas people wrongly credit Osamu Tezuka with “inventing anime” (when he actually revolutionized postwar manga – he didn’t get into anime until seeing ALAKAZAM THE GREAT, Toei’s adaptation of his manga)! And I know there are ignorant hipster “anime fans,” who would automatically dismiss this series, and not consider it “anime,” because “it doesn’t look a thing like anime.” (Yes, I’ve heard this crap all over the place, and it hurts my soul.) If HUSTLE PUNCH doesn’t count as anime, nothing does! Discotek Media could put “Hustle Punch” on DVD/Blu-Ray in the U.S.! Mori is certainly very unknown around here. His later work for Nippon Animation even if it was merely doing character designs isn’t bad at all like in one special that I think aired on Nickelodeon’s “Special Delivery” called “The Legend of Manxmouse” or even several episodes of “Grimm’s Fairy Tale Classics”. A lot of it simply isn’t available to us, really. There were several art books of his work that are released in Japan of some interest to point out if anyone can afford to find it. I love that illustration he did of Snow White and the Seven Dwarfs. It was clear he loved Western cartoons and storybooks, and did them in his own style, one just as appealing. His work definitely needs more exposure here! It’s odd… As I watch this, the English translation seems to fit the mouth movements better than the actual audio. I bet. If only something came out of this despite it’s monotone status. Could you imagine Rankin-Bass perhaps picking this up alongside working on King King with them around that time? Oh well. The character designs remind me a lot of Richard Scarry characters as filtered through a H-B treatment. I’d never seen this but I like it more than most anime. I guess my tastes are deep-rooted in Western tradition. We ALL are! I suppose we sorta expect things a certain way and out comes work from another country that is so far the opposite of what we expect. Well not to blow anyone’s mind or anything but Disney is the undisputed champ even in Japan. Good review, Mr. Brubaker. There is the few mistakes about Hustle Punch. #1, You forgot the few spoken dialogues is not translated on the subtitles. Which I saw it. #2, You misspelled Asei Kobayashi’s name spelled as Osei Kobayashi. #3, I see at the ending credits, You forgot to translate the other staff like the animators and few other staff. Like this one. Key Animators and In-Between Animators and Background Artists and Finishing Animators and other seven staffs from the credits. And that’s it. After the review. Can you review another two obscure animes called “Pikkari Bee, Boy of the Thunders” 『かみなり坊やピッカリ・ビー』 and ” Fight, Pyuta!” 『ファイトだ！！ピュー太』. Can you review it. Charles Brubaker. so pikkari-boya was a little oni? very cute! This cartoon is incredible! Thanks so much for bringing it to our attention! It puts most of the American TV cartoons made at the time to shame. I do hope it gets released on dvd soon … speaking of which, I recently purchased the 3 box sets of Wolf Boy Ken and several Toei features that I haven’t seen (from cd japan). Haven’t gotten around to watching them yet. …and thanks to Chris Sobieniak on the heads up for the Yasuji Mori books. Will definitely be keeping an eye open for them! as for Fight, Pyuta! it’s hard to tell its premise from its opening credits (perhaps similar to H-B’s wacky racers? ), but it looks like a lot of fun! I did some searching and found that hustle punch had a dvd release back in 2006 and is currently out of print. it looks like pikkari bee had at least five volumes released on dvd and is for sale on amazon japan, but I can’t find anyone selling it to usa buyers. it also looks like fight, pyuta had a dvd box set released back in 2005, which sells new on amazon japan for around $400 US. again, I couldn’t find anyone selling it to usa buyers. 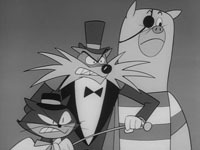 Mori designed the characters in Toei’s Puss n’Boots and Animal Treasure Island. Yasuji Mori’s Hustle Punch(1965). This is an old one, but great one. 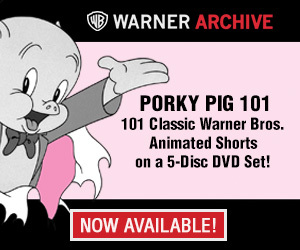 Was this cartoon released in 1965? Cmd368bet merupakah sutau situs taruhan bola online yang sedang menjadi tren saat ini untuk dimainkan, situs CMD368 adalah salah satu situs judi online terpercaya dan terbaik di Indonesia.